Should You Buy a Mac? My esteemed colleague (and fellow Mac user) Simon Meek recently wrote a piece about why designers tend to use Macs. This got me thinking: Why did I buy a Mac? I’m more of a coder/”computer nerd” than a designer. And what sort of people (apart from designers) are Macs suited to? You’re a creative type. Macs are very well suited to designers (as already mentioned), musicians, artists, photographers, and folks in the film and TV industries. Pretty much all the best creative software is available for the Mac (some of it is Mac-only), and many creative studios run mainly Mac networks. You want to edit your photos and movies. Macs come bundled with Apple’s iLife: a very nice, easy to use software suite that lets you edit photos and movies, and create slideshows and DVDs, right out of the box. No third party software to buy. You want a computer for the living room. This is partly personal taste, but Macs simply look nicer in the living room than pretty much any PC. iMacs are also whisper quiet so there’s no annoying fan noise, and Apple makes an effort to reduce the amount of cables needed (and even makes the cables look relatively pleasant!). 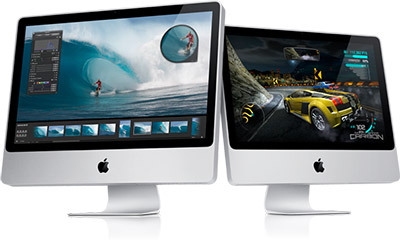 You can even wall-mount an iMac these days, and a 27-inch version has just come out. Front Row and the Apple Remote are also a great way to watch movies and view slideshows from the comfort of the sofa. You want something that “just works”. Sure, Macs crash and burn just like any computer (sometimes quite spectacularly). On the whole, though, you’ll probably find a Mac to be easier to use and more trouble-free than the average Windows or Linux box. Apple pays a lot of attention to ease of use and stability; having control over both the hardware and the operating system really helps here too. You’re used to Unix. If you’re a fan of Unix-derivatives such as Linux or FreeBSD (but are fed up with tinkering with your computer all the time) then you’ll be right at home with Mac OS X. You can mess about on the command line; compile stuff with gcc; get stuck into shell scripting, and so on. You want the widest possible software range. Again, Windows has by far the biggest range of software, including some really niche stuff. If you need to run lots of obscure, Windows-only apps then Windows could be a better choice. You like tinkering under the hood. Macs aren’t really designed to be tinkered with on either a software or hardware level (though Mac Pros are pretty expandable). This is partly why they’re as reliable as they are. If you want to reconfigure your operating system from the ground up, look to Linux. If you want to swap out graphics cards and hard drives, get a PC (or possibly a Mac Pro!). You use Windows at work, and take a lot of work home with you. If you use a Windows PC in the office, a PC at home will probably make it easier to transfer stuff between work and home. There’s nothing like using the same brand for maximum compatibility. This entry was posted on Tuesday, October 27th, 2009 at 10:59 am	and is filed under Cult of Mac, Hardware, Software. You can follow any responses to this entry through the RSS 2.0 feed. Both comments and pings are currently closed. Viruses (viri?) are another issue, to be honest. There are viruses for Macs, but not nearly as prevalent as for the PC. And any spyware that I have seen has been designed with PCs in mind, so the different look between Mac and PC makes it so obvious that the program is bogus. @David: That’s a good point re the different look. I’d never thought of that! It’s so long since I’ve used Windows properly that those fake dialogs always stick out like a sore thumb. If I did use Windows then that probably wouldn’t have been the case! Reason NOT to buy one: they cost a HECK of a lot more.